Let’s go, let’s do it! Where are we going today, Filipe? In today’s photowalk we are going to a place that everybody knows in São Paulo, but just a very few people interact with it in the way we did. Curious? It’s one of that places that just photography (and some cyclists too :)) will bring you there. 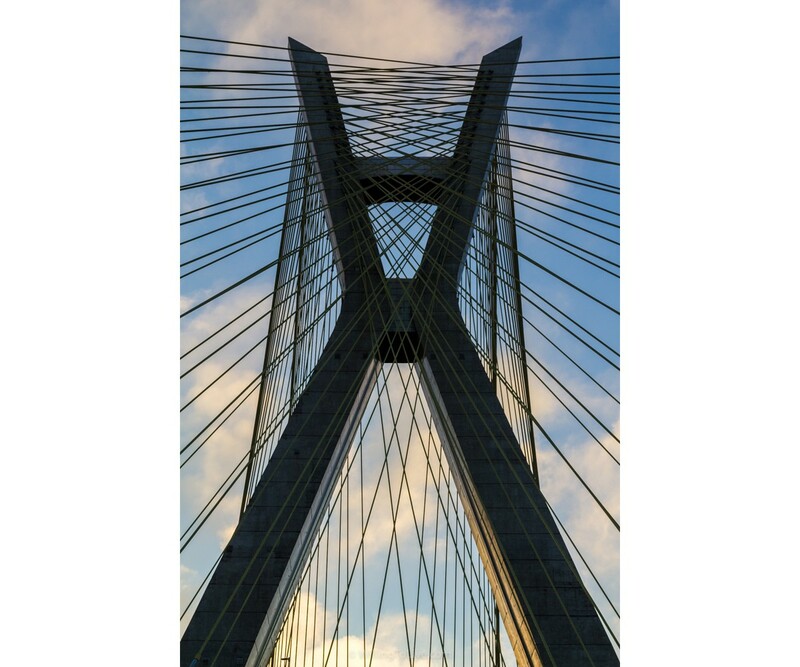 We will photowalk through the bank of Pinheiros River until the famous Estaiada Bridge (Octávio Frias de Oliveira Bridge). In this article, you will discover how you can photowalk there and I will also tell you about a personal project that can be yours too, called … well, you will discover at the end of the post :P.
But before we start, you don’t need to tell me. I know that this river is polluted and smells badly most of the time. We won’t get in the river, just around it. It won’t harm our health. But this, but that … but… but…. No excuses. If you just want to complain about everything and do nothing, ok, you can do it. But I will enjoy my life, photograph and discover a new place. If you want to do it too, let’s go! This photowalk was organized by Hugo Chinaglia. Remember him? Yes, he is the host of the landscape photography workshop in Pedra Grande, Atibaia. From time to time, he organizes some photowalks for his students. This was one of them :). The goal of this photowalk was to shoot Estaiada during the sunrise. So, we will need to be there very early in the morning. For that day, the sun would be behind the bridge and maybe we would get some interesting backlit shots after its rise. 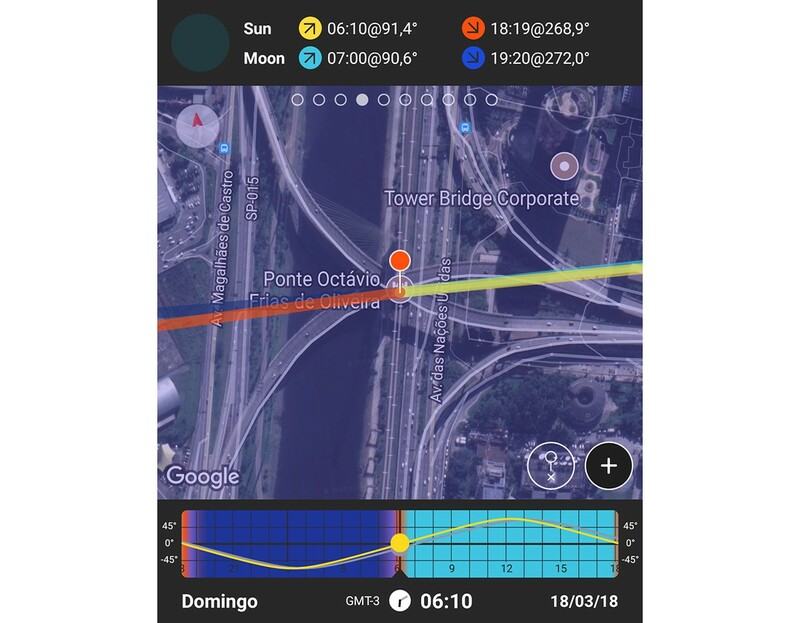 Printscreen from PhotoPills app showing when the sun and the moon will rise and set, and also their positioning at the indicated time. How do we know the sun positioning? I use an app called PhotoPills, Hugo uses it too and many others also use it. As an alternative, if you just want to check this kind of information on your browser, you can do it with TPE (The Photographer’s Ephemeris) for free. It’s always a nice idea to check ahead of time where the sun or the moon will be when you plan a landscape or a cityscape shot. The Estaiada is the main attraction, but you can also photograph the river, the buildings around it and, what a lot of people like, the reflection of them on the river’s water. What about the sunset? It is also a nice idea! That mix of blue hour and the light of the buildings that surround the river would give you interesting photographs :). In addition, in the evening, it is always easier to use the starburst effect to compose your photograph (learn how to create and control the starburst effect). When I do this photowalk again at this time, I will update this post. Below I give you the recipe to this photowalk. Is this the only way to get to Estaiada? No. There are other ways to get there. But I’ve just heard about them, I don’t know them very well and I’ve not tested them, so I won’t suggest them here. But, if you know alternative ways to get there, leave a comment below! :). Your contribution can be added to the text. It is advised to go in a big group. At least 8 people seem to be good. So call your friends to go with you. You can wait for your friends near Parque do Povo (Mário Pimenta Camargo Municipal Park or People’s Park). It is safer to wait for them near the park than at the cycle path gate over Cidade Jardim bridge (official name: Engenheiro Roberto Rossi Zuccolo Bridge). If you go there by car, you can also park around the Parque do Povo. Very early in the morning, there will be parking spaces for you. To get in the cycle path that will lead you to Estaiada, you can do it through Cidade Jardim Bridge. There will be two of them, one for each side of the river. We’ve chosen the one further away from the park. You can see it in street view below. The route is pretty easy, just keep walking on the cycle path and watch out for cyclists. Just after the Traição plant, be sure to get to the left on the fork. Coming back from the river, you can walk through Parque do Povo (to photograph there you need to go to administration and ask for a permission), you can drink some juice or coconut water, and after that you can have your breakfast in a bakery near there or even at Eataly that is near there too. There is also a shopping mall around there, JK. Plenty of options. Feel free to adjust and modify as you wish. Just keep in mind that it takes about 40 minutes to walk to the bridge. Check your schedule and pace of the hike, so that you arrive at Estaiada preferably before sunrise to enjoy the whole nature show. If you have a bike, it will help you a lot :). First of all, always remember this, the sun won’t wait for you. If you get late, he won’t. So, be on time. Obviously, bring with your photography gear :). 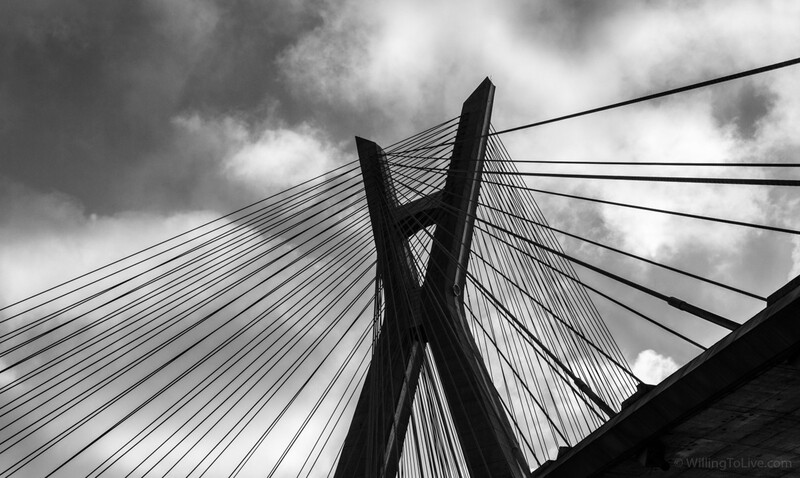 You can create wide shots but also some photographs of the details of the bridge. So, a wide angle lens and also a tele lens can be useful. Don’t forget your tripod and if you have filters (ND and polarizing) you can also use them. Sunscreen will be useful and is important to wear trousers and long socks. The latter two will help you avoid ticks. There are some stories of people that came back of this kind of photowalk with ticks, so this will help you avoid them. If you are extremely worried about them, use a tape to seal up your trousers together with your shoes. This way, ticks don’t have an easy way to reach your skin. It is crazy, but some capybaras live in that region (and also swim in the river). Just don’t try to play with them or frighten them. They probably won’t attack you, if you are just there photographing :). That day we haven’t seen any of them. But some friends also told us that they have already seen them. I also hope that you are willing to wake up early in the morning and willing to walk some kilometers :) \o/. Again, the river is polluted. So when you come back give an special attention for cleaning your shoes, trousers, your bag, tripod and so one. For me, this photowalk was really nice. I had the opportunity to discover and photograph a new place of my city, meet some friends that I’ve made on Hugo’s workshop and photowalk for the first time with Victor and Nathalia. I was following them on Instagram for quite some time (I like their photography :)), but had briefly met them just once some months ago. Thank you all for the nice photowalk and great conversations we had that day! Talking a little bit more about discovering places through photography, I have a personal project that I’m publicly announcing right now for you. It is a project that I’ve already started and I will continue to do it, but it is also a project that you can do it too! And I really hope you join us :). 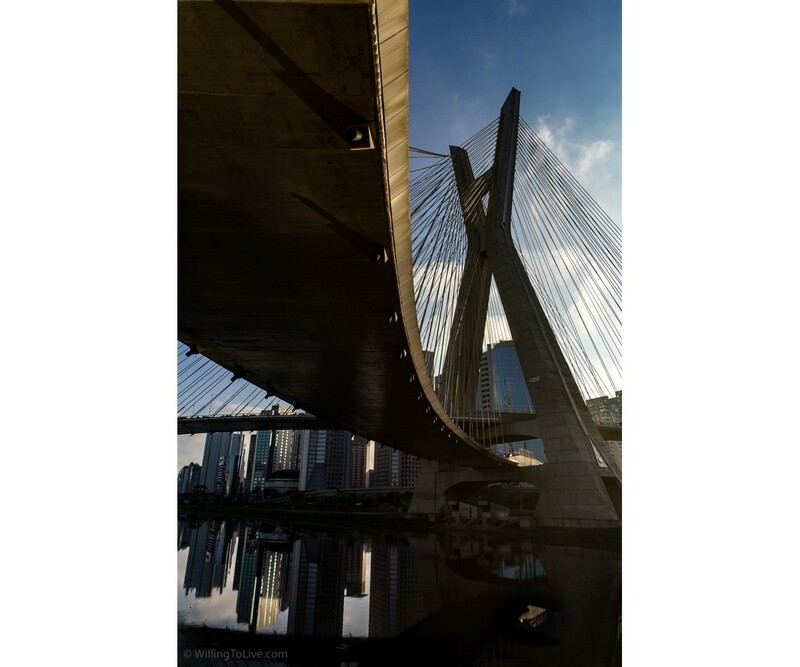 If you do photowalks in São Paulo, I think you are already doing it :). It has begun with the feeling that is unbelievable that someone (me) who has lived in São Paulo since birth does not know his own city. São Paulo is huge, but that is not an excuse. It is bizarre that I know more about the cities that I’ve visited while traveling than my own. For me, the best way to visit a spot is by photographing it. It is very good to really know that place, you pay attention to the details, you really live that place for some time. Photography can also create and potentialize rewarding moments of joy and discovery. It teaches you to see things differently. It is the perfect combination for me. 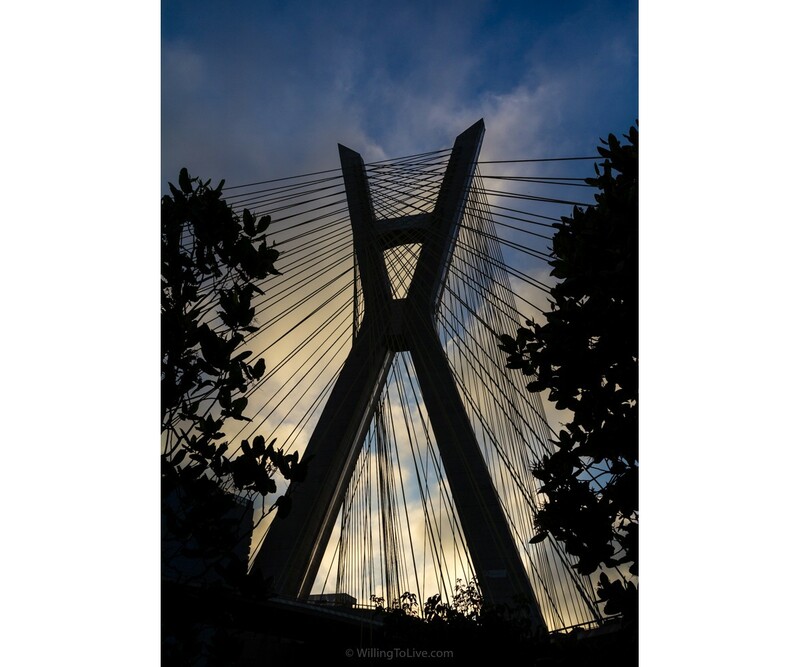 Besides knowing my city (and many other in São Paulo state), enjoying my life and practicing photography, I want to create a really good and extensive guide on how to photowalk in São Paulo. I’ve already started and you will see more posts like this in the future teaching how to do a photowalk in many places of SP. Why a guide? Because I want that other people also enjoy all of this too! 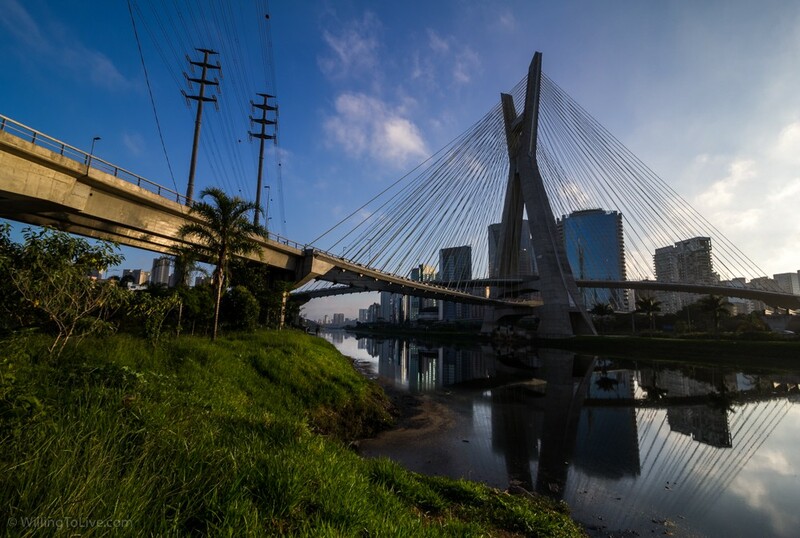 Let’s discover São Paulo together!